Last week Pete said todays match would be on Longs unless there were more than twenty fishing, in which case we would be split over Longs and Sellicks with separate pay outs for both. We got there in good time and with twenty four anglers fishing there would be twelve on each lake. I didn’t mind which lake I drew but a fairly sheltered swim would be a massive bonus with very strong, blustery winds forecast. On arriving one of the first people I saw was Ivan Currie of Ivan’s Angle fame, I knew he was fishing today and it was great to catch up with him again. I also saw Glynn who wanted double of quits on the pound from last week and I finally met Mark Cox who is organising the Gary Bull fundraiser on the 11th April. I’m really looking forward to that match, there are already over 50 people booked in and there are loads of great raffle prizes and it’s for a very worthwhile cause. Pete announced the draw and everybody delved in, Ivan pulled out peg 39 on Longs and it was also one of the golden pegs, Janders was on Longs peg 30 which has been a good area of late and I ended up on peg 4 on Sellicks which can be a great peg and Scott won off it on Wednesday with 48lb of carp fishing long although I would, as always, be fishing for silvers. Janders and me had discussed what we would do regards the side bet if we were on different lakes and had decided the fairest way of doing it would be to do it on silvers if we were on the same lake or overall weight if we were on different lakes. For company I had Adie Bishop on peg 2 and Bill ‘The Paste King’ Hopping on peg 6 so plenty of room which is always a good thing. Adie’s peg had won the silvers in the midweek match with 19lb and according to Heardy we were all fishing for second place. The wind was already hideous and it would be a case of battening down the hatches, I set up the usual 0.4 gram Malman Pencil with 0.10mm bottom and size 18 Tubertini 808 hook and also set up a Drennan 0.6 gram G-Tip but I never picked it up all day so no more about that rig! I wanted to try and keep things as simple as possible so plumbed up three lines at 10, 8.5 and 5 metres, I would try and fish at the longer length but depending on the wind I had the other two as back ups although I’m yet to have a bite on the short line after two matches! On the whistle I put half a pot of micros on the 5 and 10 metre lines and would feed the middle line if I had to go on it, before starting with a 4mm expander on the longer line. The rig settled, the float went under and for once I didn’t miss it and carefully shipped back before netting a decent skimmer – great start. I had two more and then landed a good skimmer that was foul hooked under the wing and after an hour I had eight skimmers and a small carp and was bagging. The wind was blowing the pole all over the place but when I could actually present the rig sensibly for a few minutes I’d get a bite. Adie had a few skimmers but was already saying that he was getting battered! The second hour was a little slower but I did add a couple more decent skimmers and a small carp but also had a good skimmer literally blown off the hook and I bumped a decent fish too. 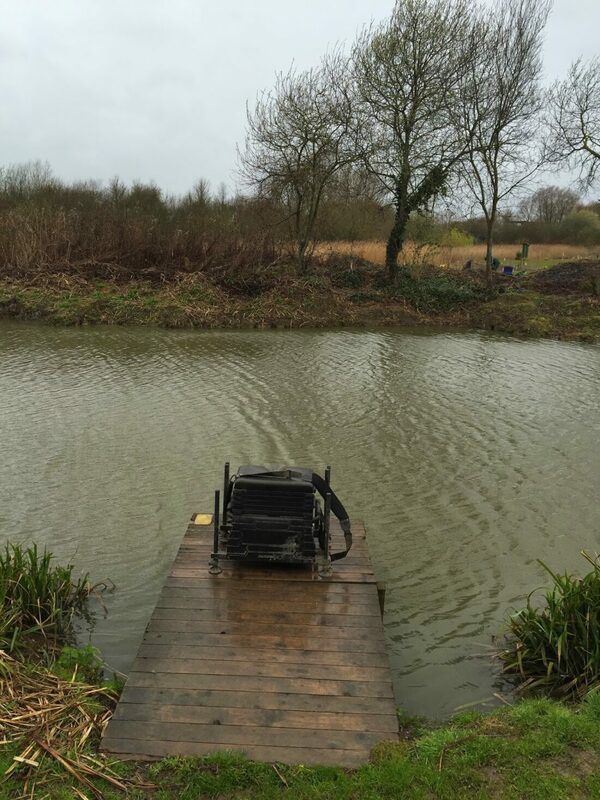 The wind was really doing my head in and one particularly strong gust saw most of my bait boxes fly off my side tray! Luckily I managed to retrieve my expanders but one box lid disappeared into the lake, never to be seen again. Adie was now getting some decent skimmers although he was still saying I was miles ahead of him. I kept trying the 5 metre line but for the third match running I haven’t had a bite there although crucially the rest would do my longer line the world of good and as soon as I went back out, I’d get a couple of quick fish. It was obvious it was fishing a lot better than last week and I could see Ray opposite on peg 21 netting some skimmers and Glynn was getting a few up on peg 8 as well. It was a shame the wind was so bad as I think we’d have caught some really good weights if we could have presented our rigs properly. On several occasions the wind bounced my micros out of the toss pot before I could feed! Last week Scott had 13 skimmers for 9lb 5oz so I thought if I could get to 26 it would hopefully give me around 18lb but I did have some smaller 6oz skimbobs. Adie and me were having a right old battle and it was fish for fish but I hoped my good first hour would keep me just ahead. Frank and Jake turned up to have a look as they’re both fishing the charity match and hadn’t seen the venue before. I had a carp and a small 2oz skimmer while they were there before they went to see how Janders was doing. When they got back they said he was fishing the feeder and had caught some nice bream, they also said quite a few anglers on Longs were fishing the tip. With about two hours to go I’d reached 20 skimmers and 5 or 6 carp, I was still getting bites from the ten metre line but still nothing from the short line. Heardy on peg 19 packed up early and said that Ray was catching silvers well and had double figures and that Steve Kedge and Jess Jordon were both doing well catching carp but he said I could be in with a shout as well! Adie was still getting some good skimmers and it was going to the wire although he still reckoned I was well ahead. It was really hard work trying to hold the pole in the wind and my back was killing me and I knew I’d be suffering later on. I got to 26 skimmers with 10 minutes to go and then had my eighth carp, which I played gently thinking it might be my last fish. I netted it and a quick glance at my watch showed there was a minute or two to go so I stuck on an expander and shipped out without bothering to put any feed in the toss pot and the float settled and sailed away and skimmer number 27 was a ten ounce fish and I still had time to go back out but as the rig settled, Pete called time. I packed up relieved my pole was still in one piece, Nigel Wickham hadn’t been so lucky and 13 metres of his three grand pole was now in Longs lake! Janders turned up as he couldn’t get his tip rod apart, he said he’d caught seven good bream and a carp so it could be tight for the pound. Glynn came down and conceded the £2 but didn’t have any change on him (that old chestnut!) and that’s 3-0 this year so far, it won’t last. Ray was admitting to 15lb of silvers which meant he probably had nearer to 20lb and I was sure I didn’t have that. The scales started on Longs and there had been some good silvers weights, Ivan had struggled in peg 39 and it’s still my least favourite peg on there, peg 3 did 26lb 4oz of silvers and Nigel Wickham had 31lb from peg 27, Janders had some lovely bream for 26lb and a carp for a total of 28lb 1oz and would have battered me if the side bet had been on silvers. Chris B continued his good run when he took the lead on the lake with 32lb 15oz of bream and 15lb 5oz of carp for 48lb 4oz. Adie was first to weigh and he had 13lb 3oz of carp and then his silvers went 16lb which was a lot more than I thought he had, my carp went a level 21lb and my silvers went 17lb 12oz to give me 38lb 12oz and a pound off Janders although I have to reiterate that he battered me on silvers with a superb bag of bream skilfully caught on feeder tactics (how’s that mate?). The Paste King didn’t weigh in and then Glynn had 13lb 3oz of silvers which included some nice roach and perch (on worm of course!). I didn’t see the rest of the weigh in as I took the kit to the car but was scarred for life when I met Adie coming the other way in just his (very wet) underpants and a t-shirt! He’d been in Longs to get Nigels pole which was recovered successfully although it did have a broken section. 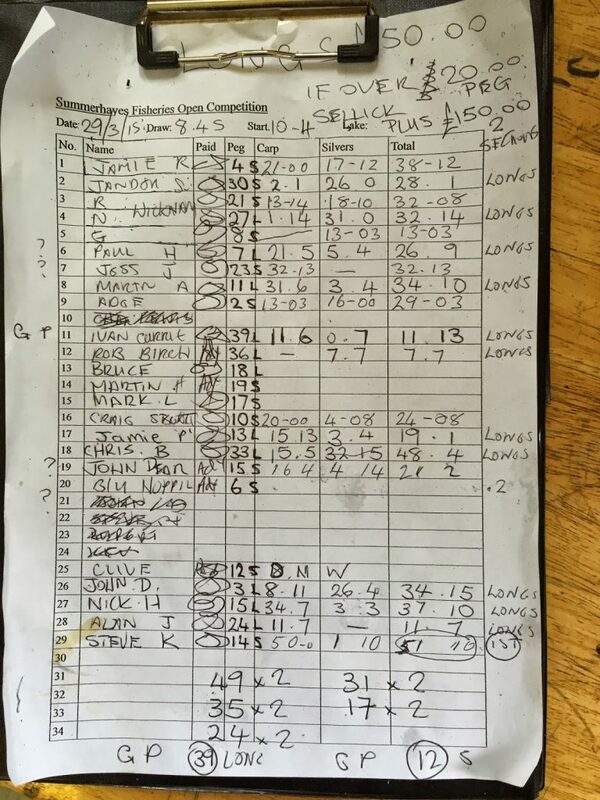 Back at the results and Steve Kedge had won our lake with 51lb 10oz from peg 14 and as Jess Jordan was third with 32lb 13oz, I’d sneaked second place and picked up £35. Ray had won the silvers with a cracking net of 18lb 10oz which meant Adie Bishop picked up second in the silvers. So both lakes had fished really well given the conditions and I’d be well chuffed with my weight of silvers in next weeks two day pairs festival and if Ray (my partner) could catch 18lb again, that would be great! Nice one mate, I wasn't far away from there on Sunday evening! Cheers mate, you should have popped in and said hello!